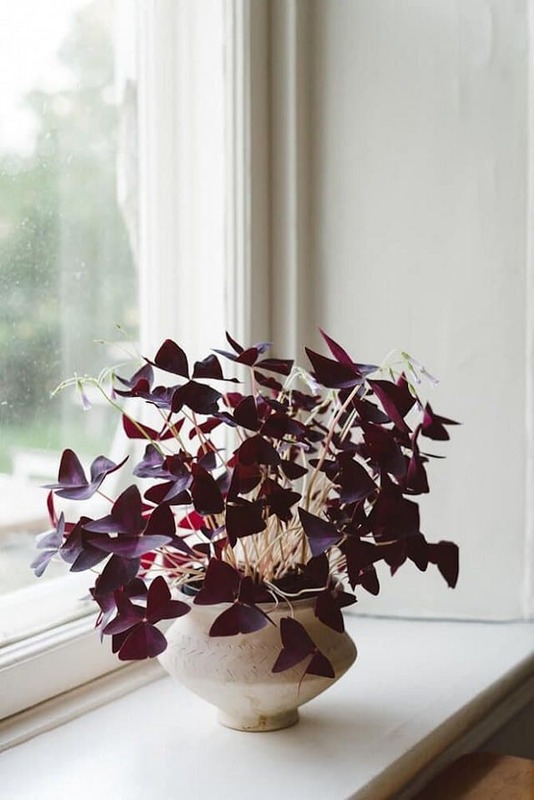 Native to Brazil, Oxalis plants display unique, pinwheel foliage and a wealth of starry blossoms. 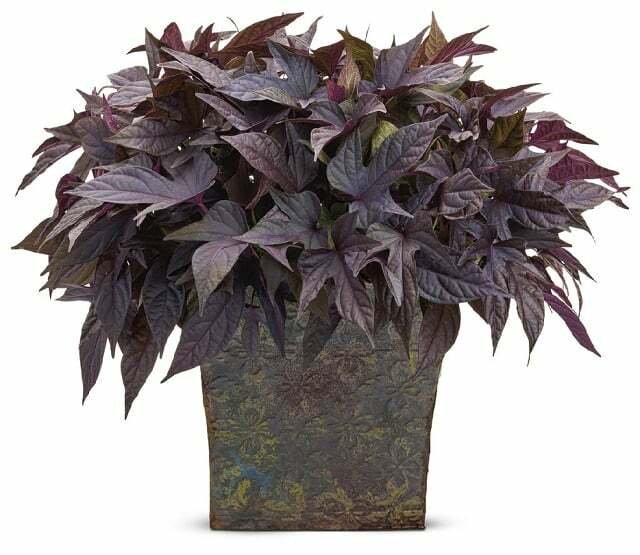 Some varieties produce purple leaves or foliage with deeper accent markings. Its delicate foliage and dainty flowers make it an ideal choice for containers and indoors alike. The tiny, triangular leaflets close at night, which make it a fun plant to have around the house. Coleus is a beautiful, showy plant that is available in various colors and styles. 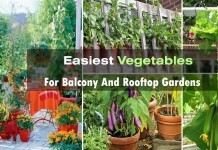 Mostly used as an annual for outdoor gardens, it is super easy to grow as an indoor plant as well. The vibrancy of its colors comes from receiving an adequate amount of sunlight. The more the light, the more vivid the colors. However, shade does allow the colors to form as well, though they will be a tad subdued. Coleus is remarkably easy to propagate. The eye-catchy, fancy leaves can liven up a dull drawing room, while the compact structure does justice to space-constrained corners well. 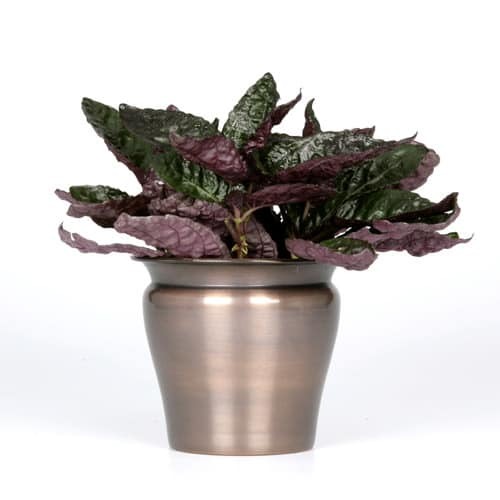 The prayer plant, with its unusual, purplish brown leaf markings is a fun little plant to have around the house. Also known as rabbit tracks, it has two different varieties, the green, and the red one. The latter has bold red leaf veins alongside the markings. Leaves close at night, thereby creating the appearance of praying hands. Prayer plant thrives well on moderately high humidity and uniformly watered soil. However, it appreciates remaining on a drier side in winter. We love this! One of the most gorgeous and versatile plants around for CONTAINER GARDENERS, sweet potato vine, performs well in both partial sun and shade and looks pretty in container gardens, borders, garden beds and landscapes. 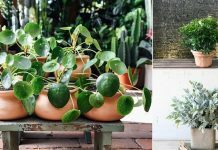 The plant is mainly loved for its brilliant foliage that is available in different colors of lime, purple, bronze, black or copper. And since its beauty comes from its leaf, the plant can be enjoyed all year long without having to wait for the blooms to show up. Sweet potato vine grows best in the moist and well-drained soil. It is remarkably flexible regarding light requirements. 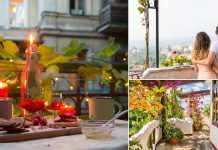 A unique, easy to grow houseplant, the Wandering Jew is a popular houseplant that is both easy to grow and looks amazing in a hanging basket as well as in a topiary form. The most widely available variety of this vine has leaves marked with characteristic olive and silver markings on the top and a dark purplish maroon color on the undersides. 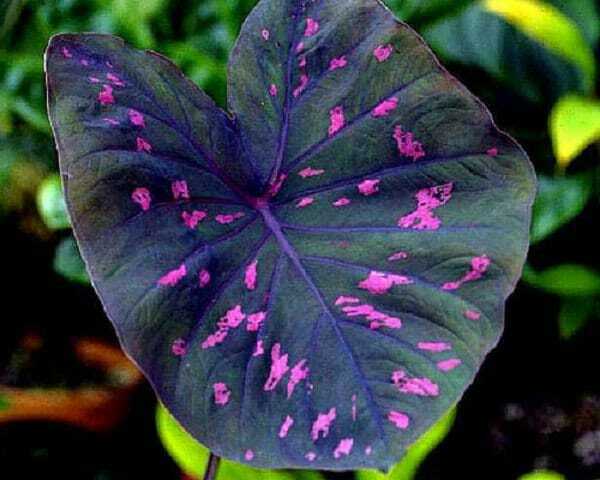 Some varieties flaunt a purplish color on both surfaces of the leaves. 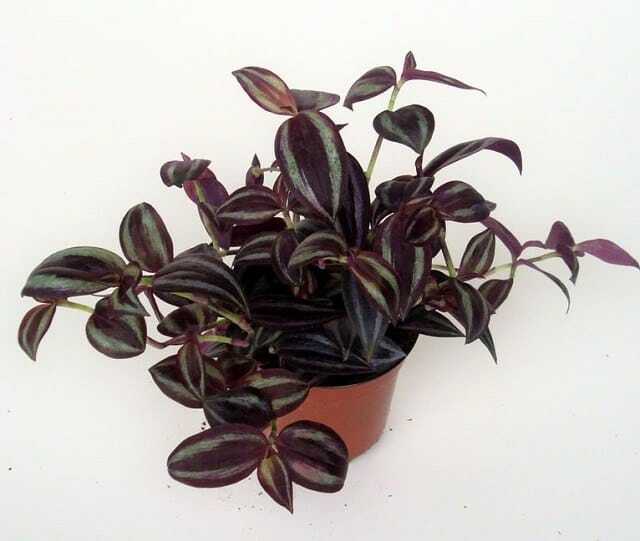 Wandering Jew thrives well on medium to bright low light and uniformly-watered soil. You can grow this plant from stem cuttings stuck in water or a moist potting soil. It’s recommended to allow the soil to dry in between watering spells. 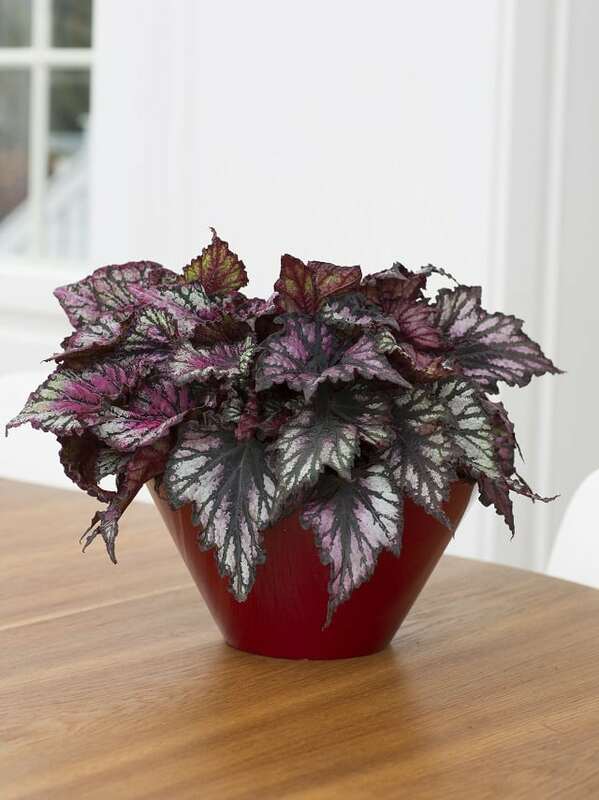 Ti plant is an astonishing red-purple colored houseplant featuring flamboyantly colored foliage and an elegant appeal; the ti plant is a perfect choice for adding a pop of color, style, and drama to a well-lit corner of your room. Most varieties have strap-like leaves variegated with bright streaks of different colors of hot pink, white, cream, or deeper shades of purple. Ti plant is picky about sunlight and likes to be in a spot that receives a partial sun. Rex begonia plants are cherished for their dramatically colored and textured foliage. The leaves come in a broad spectrum of colors, shapes, and stripes. While the flowers are insignificant, the unique leaf shapes and attractive color combinations of silver, red, purple, white and pink pretty much makes up for it. 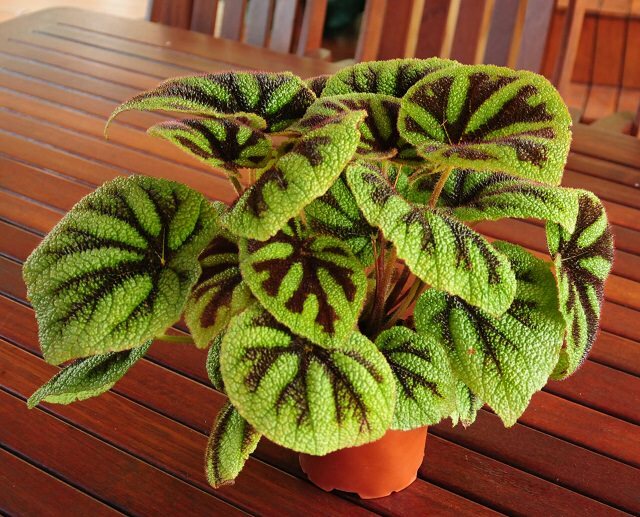 Rex begonia mostly enjoys shade gardens, which makes it apt for indoor gardening. Soggy soil and excessive use of fertilizers lead to instant rotting, while prolonged wet leaves make them susceptible to infection. If you keep these in mind, caring for your Rex begonia plant will be a breeze. This lovely houseplant has fuzzy green foliage with a dab of purple hairs and edges. Grow it in any neutral colored houseplant, and you’ll see how it’ll stand out from the other houseplants. Its characteristic purple sheen comes when it is touched by a fleck of sunlight. Purple passion has an upright habit when young and becomes more vine-like and spreading as it matures. This makes it a perfect choice for adorning hanging baskets and small trellises alike. The plant enjoys the bright light and evenly moist soil. Caladiums are beautiful tropical plants with big, wafer-thin leaves having varying patterns in reds, pink, purple and cream. The brilliant foliage of this plant is its USP, as it is available in unusual shapes like hearts, lances or arrows, as well as eye-catchy color combinations of red, pink, rose and white. Being a shade plant, it doesn’t mind growing indoors, though it requires a minimum of 3-4 hours of filtered light each day. 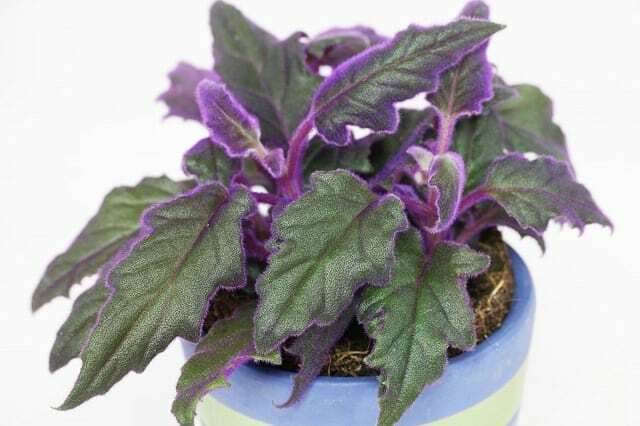 The waffle plant is a beautiful tiny houseplant with colorful foliage having a metallic tone in purple color, the striking appearance, which makes it an excellent addition to your home or office. Its small stature makes it ideal for decorating crammed-up desks or countertops, while its low growing nature makes it suitable for use as a groundcover underneath larger indoor plants like ficus trees. Waffle plant benefits from medium to bright light indoors. Remember, if it doesn’t get adequate sunlight, it may lose its vibrant purple coloring. However, direct light is a hazard as the leaves may bleach and undergo sunburn. 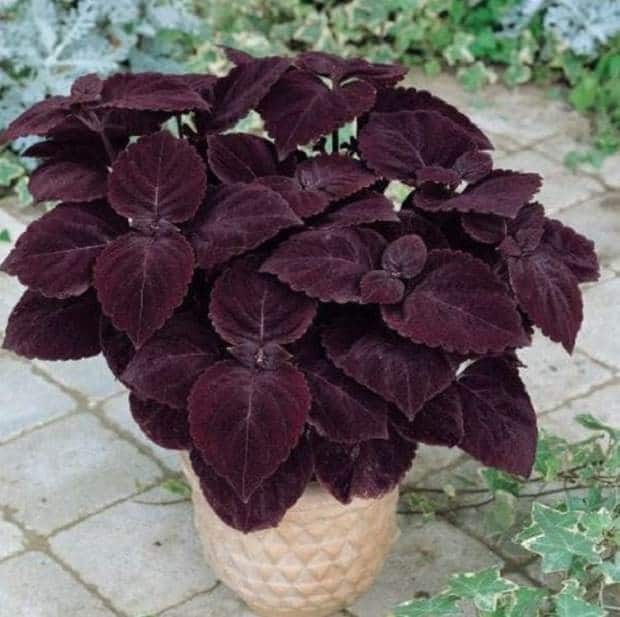 Accent the waffle plant’s brilliant foliage with a terracotta container for a classic appeal. Red aglaonema is a spectacular Chinese evergreen plant with stunning, purple or red-tinted leaves. One of the easiest houseplants to grow, red aglaonema, is a new and stylish entree to the world of houseplants. 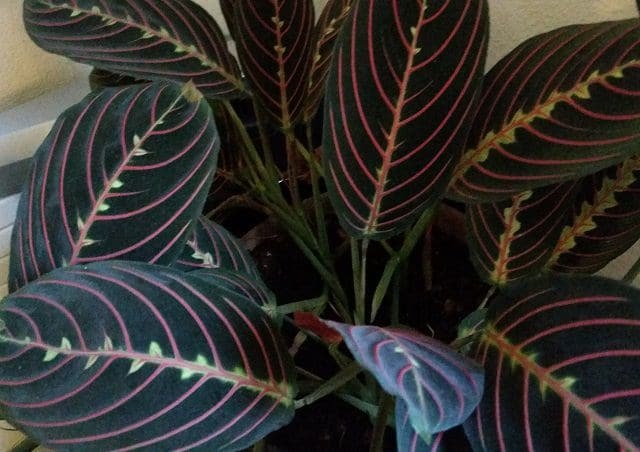 This beauty flaunts dark green leaves marked elegantly with bright red, purple or pink stripes. 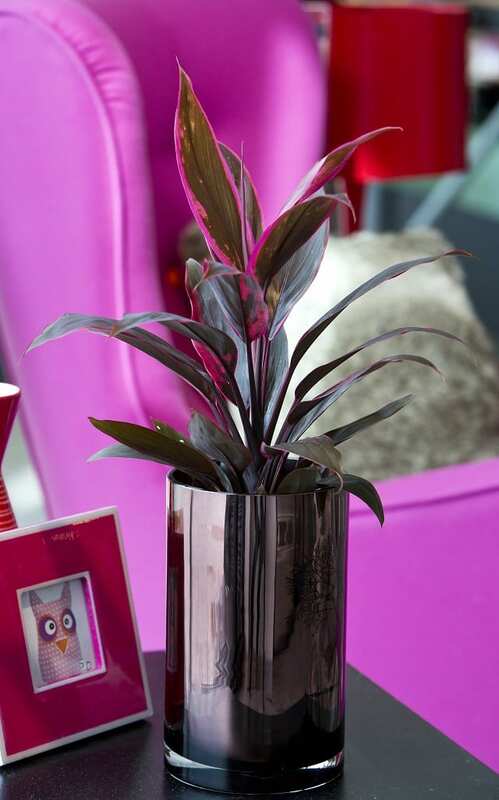 Its colorful foliage makes it apt for decorating desks, tabletops, coffee tables as well as side tables in bedrooms. You can also consider using it as a substitute for poinsettia this season. The long-lived houseplant retains its color all through the year and demands little care in the process. The calathea is one of the most beautiful houseplants that has the potential to light up any room with colorful accents. 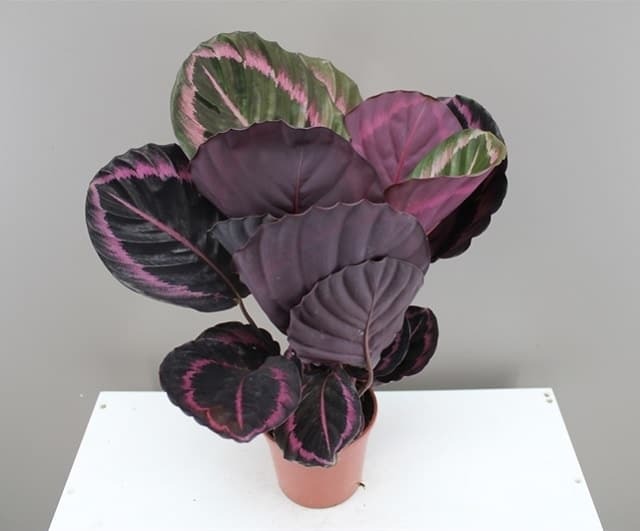 With a special marking of stark white veins against red, purple, green and cream leaves, the calathea lends an exciting and fashionable touch to your home. Most varieties have reddish purple color on the undersides of leaves, which makes them attractive when viewed from both above or below. This beautiful New Guinea species is a must for you if you love growing unique indoor plants. Its leaves sport wide, chocolate-brown markings which stand out well against the dark green backdrop and radiate all the way to the leaf margins, thereby resembling the German iron cross. The beautiful coloration set against solid green with a coarse, pebbled texture makes for a very royal presence that is sure to liven up your home like none other. The plant prefers humid conditions, though you are best off cutting back on the water amount if you notice yellowing or browning of the leaves. The mention of rubber tree immediately conjures up images of latex oozing out from barks. True that but it is one of the most popular houseplants today and why not it looks impressive indoors and cleanse the air too. Its leaves appear dark purple when mature, and bright red when young and opening. 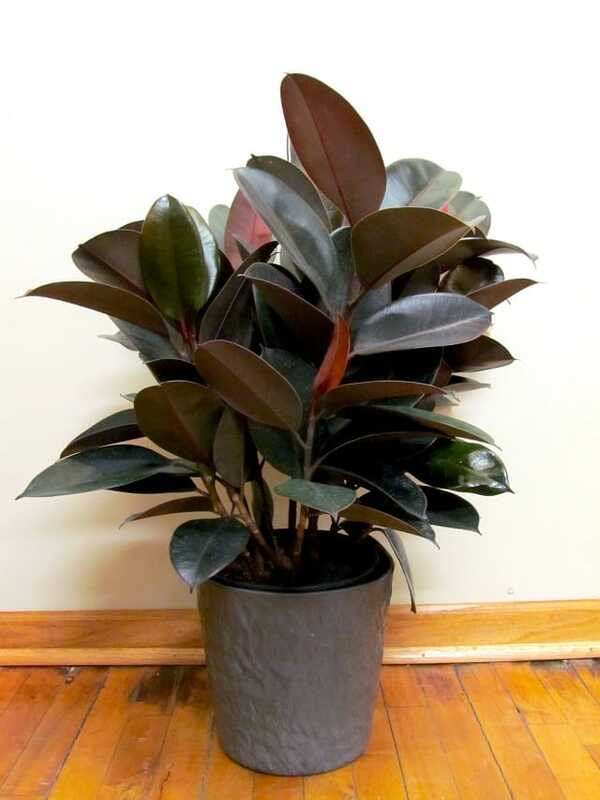 Learn how to grow a rubber tree houseplant here! 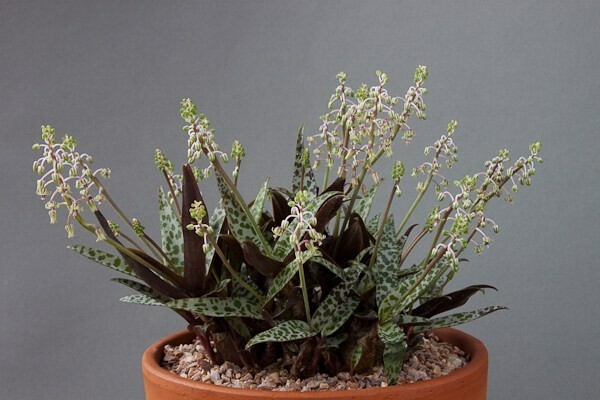 Contrary to its name, silver squill is a tough little plant. Hailing from the Cape Province of South Africa, it grows in dry habitats and stores moisture in its succulent, bulb-like stems as an adaptation tactic against the moisture-deprived soil. With its unique structure and colorful foliage, it becomes an unusual houseplant, which is sure to attract plenty of eyeballs. The plant derives its name from the lovely, silver-colored polka dots on leaves and the rich purple undersides of the stems. It’s easy to care as well, provided you grow them in the shade. These are beautiful, but I’m afraid to buy houseplants for fear they may be poisonous to my cat. Are any if these safe for pets? 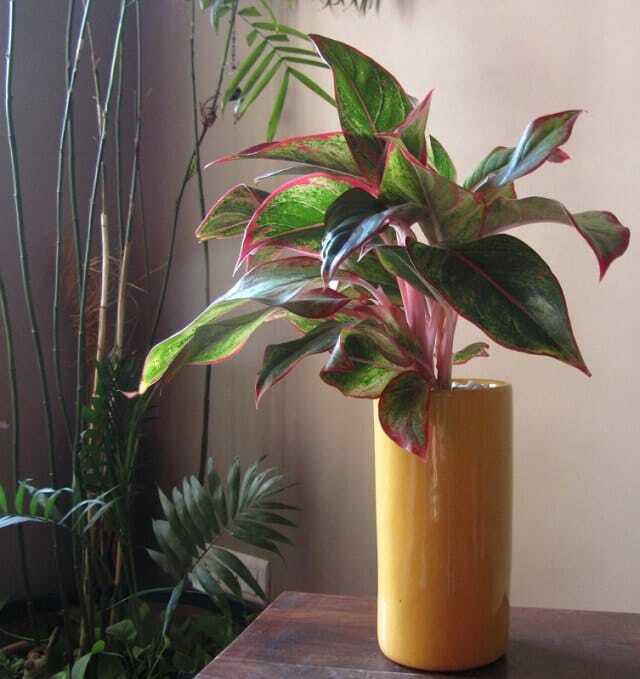 Red aglaonema is poisonous to all pets.